Shopping for Dragon Ball Statues? "Final Kaaa… Me…. Haaaaa… Me…. HAAAAA!" 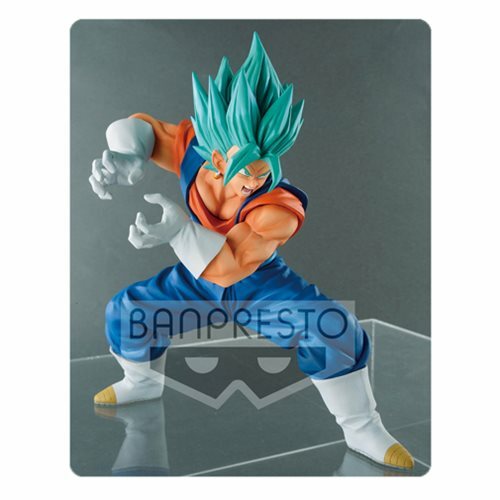 Perfectly captured in all the muscle bulging glory, Banpresto presents Super Saiyan Blue Vegito about to unleash a super powerful finishing blast! Taken from the popular Dragon Ball Super anime series, Vegito, the combination of Goku and Vegeta through the use of Potara earrings, is one of the most powerful characters to appear! Other figures will tremble with fear at the sheer will and power expressed through of this amazing figure design. Standing in a battle stance at 6 1/3-inches tall with careful sculpting craftsmanship and attention to high quality color, this figure includes a foot base for balancing. Minor assembly is required. Ages 15 and up. "Entertainment Earth is a great company with excellent customer service. They found a problem with my account, called me and helped me take care of it right away with little effort on my part. I am now a customer for life! Thank you so much for being there for me"
"Entertainment Earth is a great company with excellent customer service. They found a problem with my account, called me and helped me take care of it right away with little effort on my part. I am now a customer for life! Thank you so much for being..."